I'm a law student trying to keep a balance between school, self, relationships, and training. Looking to rent tables and chairs for the reception? Try contacting the local schools or school district. They may let you borrow their foldup chairs and tables or for a donation. TH is going to check into his high school which is close to the venue. It's also a small private school, so i think that helps. Keep your fingers crossed! I hate overplayed cliches. I chose this song to walk down the aisle. A pic from a wedding yesterday. Her ball gown converted to a cocktail dress. Brilliant! It's been about 3 weeks since Pac Crest. I took a full week off to recover. One week turned into two, into three. I went on a short jog here and there but really nothing that made an impact. My feeling of flabbiness was confirmed last week at my doctor visit where I learned I lost 5 pounds. Typically, I'd be fanatic about losing weight. However, the only way I lost weight this past month was from muscle loss. Gross. When I turned on the tv this morning, I stumbled upon the Iromman World Championships. I cried when the reporter talked about everyone's story in true Jayme fashion. It also motivated T and I to go for a run and to sign up for the Diamond Lake Longcourse Tri. It'll be held in the foothills of the mountains east of Seattle. I'm still pissed and disappointed about what happened at Pac Crest. I need to stay in shape for the sake of fitting into my dress next year. I need a goal to push me to stay active. Folks, I got a triathlon to do. 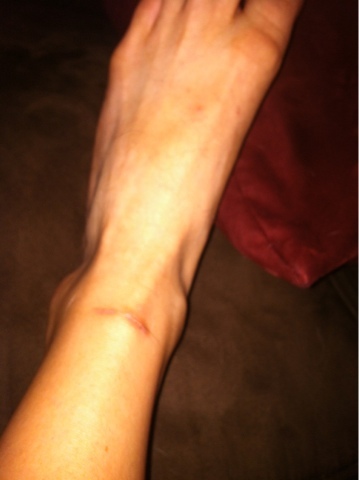 Ps, checkout the nearly scar I received from my timing chip band. Asides from wedding stuff I've been busy getting my work situation figured out. I live in a small town and the legal opportunities aren't exactly waiting around to be snatched up. Push come to shove, I ended up entering into a partnership with another attorney. It's hard to start your own law practice. Hopefully by this time next year we'll be more established and clients will be knocking on the door. Over 14 months away. We have decided to go the route of "let's plan this thing as early as possible so we can be less stressed later and be on the lookout for good deals." So far we've picked a date, our venue, and I've picked my bridal party. T already knows who he wants for his groomsmen, but just hasn't got around to ask them yet. 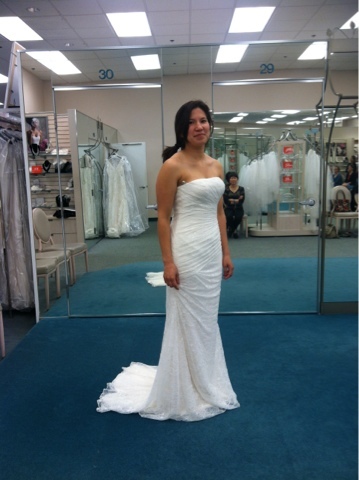 I went dress shopping trying on with my mom and and MoH last Saturday. T and I are going into this adventure with the expectation that we will pay for everything ourselves. We have a decent budget but would like to spend less if we can. My thoughts on a wedding dress has been to try on the the style I want to make sure it looks okay on me and then order my dress online through eBay with plenty of time for alterations down the road. This is a much more cost effective solution, especially if you're like me and aren't picky and don't fret the small stuff. 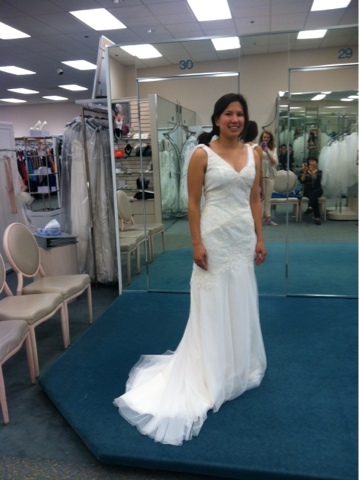 To my surprise, my mother decided that she would pay for the dress. Thanks to Pintrest, I went in with a very particular style in mind. Lace, Lace, more lace and an keyhole back. The only issue is that I'm 5'3" on a good day and more round then narrow. 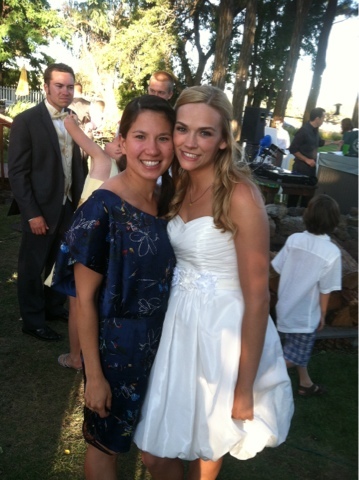 Most wedding dresses are shown on the tall skinny model-type. Thus a beautiful gown in pictures might look like crap in person. 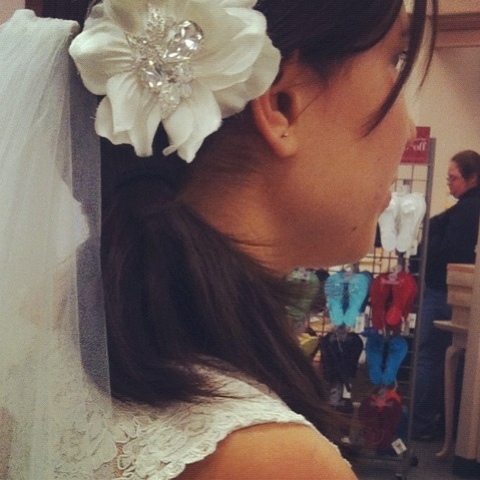 So off the David's Bridal the MoB and MoH and I went. Let's face it, unless I want a quinceanera dress, I have no other choice in my hometown. Ironically, they didn't have a few dresses in my size. They had the size smaller or 3 sizes larger. 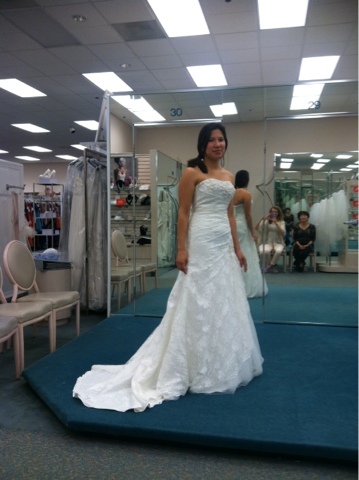 weird I tried on dress 1. Exactly what I was looking for except a size too small so the back looked a little funky. Not bad but not perfect. Dress 2 was not it at all. Too froo-froo. Dresses 3 and 4 were immediately vetoed. One, according to my loving mother, made my hips too big. The other was a beautiful dress but was too "cupcakey" for me. Then there was dress 5. 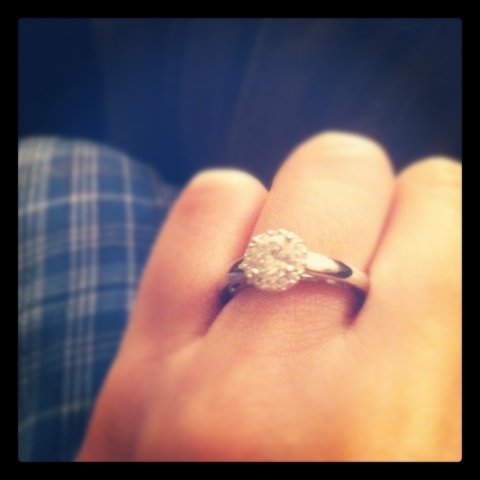 Beautiful, full of lace, but according to my mother "too old fashion." 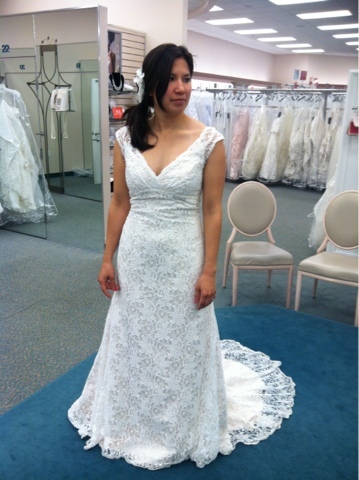 While I loved the dress, all the lace and beading made it super heavy. It was flattering but MoB thought it was too low cut in the front. Wouldn't want to offend any of the older folk.... or Jesus. I then went back to dress one. I tried on the too large size this time and the back looked a ton better. MoB couldn't get over it and was very vocal about her liking of this dress. I liked it too. Then out came the consultant with The Veil. Oh, The Veil. You have a crazy way of making a simple white dress turn into The Dress. It was beautiful. I felt like a bride. I really felt like T would cry if he saw me in this dress. And that my friends, is how I bought my wedding dress 14 months before the wedding. Not digging this dress though it's pretty flattering. 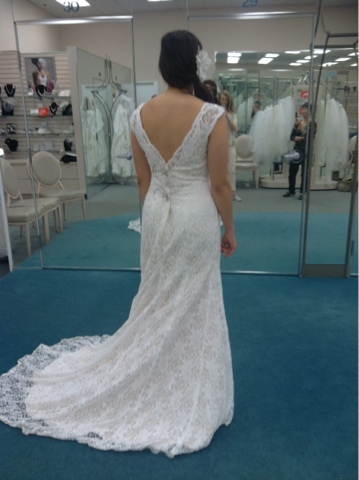 Loving the back and the lace. Someone tell me how to plan a budget friendly gluten free wedding. Significant other extrondinaire and race chauffeur. (Wo)man's best friend, kitchen floor vacuum and foot warmer. What on earth do I eat now?